In this article, we'll introduce you to Andi®, your personal analyst built into PrecisionLender. Andi® is the product of machine learning and artificial intelligence work, and she’s your ideal lending analyst built into PrecisionLender. She works on thousands of deals each day with bankers like you using PrecisionLender. Andi®’s goal is to use the information in PrecisionLender to give you insights that will drive pricing decisions that are more profitable, less risky, and focused on delivering the customized service that your clients need. As Andi® becomes a better analyst, she applies her knowledge to help you win more deals that work for both the borrower and the bank. What are machine learning and artificial intelligence? Machine learning and artificial intelligence, which are also commonly called augmented intelligence and AI, refer to technology that uses data to make recommendations or anticipate actions. Andi® will use machine learning to leverage the vast amounts of data that PrecisionLender has about how loans are priced and how relationships evolve to give you actionable, valuable information to help you better serve your clients. For more information on the role of AI and machine learning in banking, check out our Resource Center! What can Andi® help me with in PrecisionLender? Andi® builds on PrecisionLender’s ability to help you make deals work by recommending ways to improve profitability or mitigate certain risks, and she’ll become more helpful to you over time as she keeps learning. Andi® gives specific information that will make the biggest impact as you’re pricing deals by using Andi® Skills – an “off the shelf” set of skills built by PrecisionLender that powers Andi®’s suggestions on how to meet your targets. Andi® Skills drive Andi®’s ability to work with you as you price each Opportunity, showing you how to make the deal work, recommending other structures, and even identifying and highlighting opportunities to expand a relationship. You can also ask Andi® questions and she’ll search for relevant articles from our Knowledge Base to find you the best answers. Andi® also provides tutorials that show you how to complete some processes in PrecisionLender. In the future, you’ll be able to add, remove, modify, and extend any Andi® skill to make sure that Andi® understands your specific needs and helps you in the right ways. How do I find Andi®’s recommendations or ask her a question? Andi® lives on the Opportunity Screen in PrecisionLender and uses colored bars to let you know that she has suggestions or alerts about your deal structure. Click in a field where you see colored bars on the Opportunity Screen to show Andi®’s suggestions for that specific item. 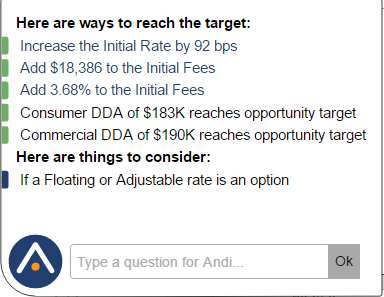 Click Andi®’s logo ( ) in the lower part of the Opportunity Screen to bring Andi®’s recommendations on deals onscreen. You can then type a question in the “Ask Andi®” box and press Ok to have Andi® search for relevant articles from our Knowledge Base. After Andi® answers your question, you can let her know if her answers are helpful, which will help Andi® learn and become a better analyst. What do the colors around Andi®’s logo mean? Colored bars around Andi®'s logo mean that she has information for you – just click Andi®’s logo ( ) to bring her recommendations onscreen. When you see a loading icon rotate around Andi®’s logo, it means that Andi® is thinking – she is searching for suggestions on your deal terms or for an answer to a question that you’ve asked her. What does each color that Andi® uses to make suggestions mean? Green bars let you know that Andi® has suggestions or ideas to help you achieve your target. Do I have to teach Andi®? How will Andi® change over time? Andi® learns the more that she works with you. You don’t need to actively teach Andi®, but giving her feedback by letting her know if her answers were helpful will help her learn to give you better answers. If there is something specific that you’d like Andi® to know or do, please reach out to our Support team at support@precisionlender.com or 1-877-506-2744. What kinds of questions can Andi® answer? Right now, Andi® is focused on searching our Knowledge Base for the best answers to your questions about using PrecisionLender. Because Andi® can search for lots of different information, asking her questions in complete sentences (instead of using just one or two words) will help her find you better answers. If Andi® can’t find exactly what you’re looking for, she can reach out to our Support team for backup. What happens to my custom profitability rules in PrecisionLender? If you’ve worked with our developers or consultants to create custom profitability rules in the past, those rules work the same way that they always have and are part of custom Andi® Skills. Andi® shows your custom Andi® Skills in the same place that she shows her other recommendations, or in the same place that your custom profitability rules were displayed before we introduced Andi®. Excellent! Please reach out to our Support team at support@precisionlender.com or 1-877-506-2744 and we’ll be happy to help. I wish Andi® had this (fill in the blank) skill. Great idea! Please contact our Support team at support@precisionlender.com or 1-877-506-2744 and we’ll make sure that Andi® brushes up on her skill set so she can deliver exactly what you need. I'd like to know more about Andi®.